A wicked update for our beloved Fugue Machine!! Now an audio unit and supports chromatic mode! Fugue Machine now works on iPhone! Fugue Machine now includes an AUv3 MIDI App Extension! Open your favorite AUv3 MIDI Host and run as many Fugue Machines as you’d like! Requires iOS 11.0 or later. The Scale parameter now includes Wholetone, Whole Half, Major Blues, Minor Blues, Major Pentatonic, Minor Pentatonic, and Chromatic. 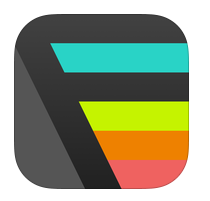 Fugue Machine now properly adapts to the size of the view it’s in, with pixel-perfect detail for all devices. The Piano Roll now responds significantly better to gestures. Most noticeably with one-finger note-panning, one-finger note-length changes, and one-finger pan-right note creation. You can now copy/paste Fugue Machine patterns. This works within the standalone app, between the standalone app and AUv3 instances, between AUv3 instances, and between devices. To copy/paste in the standalone app, go to More Menu > Patterns, and long-press on any pattern. To copy/paste in an AUv3, go to the More Menu, scroll to the bottom, and use the copy/paste buttons. When moving notes in the Piano Roll, the Keyboard View and Overview View now show the same notes moving in real time. This is useful while moving notes beyond the visible boundary of the Piano Roll. The View Braces (located in Keyboard View and Overview View) can now have each side moved independently, making it much easier to navigate/zoom the Piano Roll. Until now, when you’d perform a gesture on the Piano Roll and move beyond its boundary, the Piano Roll would automatically scroll in the direction of your fingers. No more! Much more usable now I think. However, if you enjoyed this feature, you can reenable it in Settings. To be honest, most of this update was unexpected! About a month ago, I decided to venture out on a small FM update to take a break from my main project (a new app I’ve been working on for over 2.5 years!). My only intention was to update the UI to accommodate the new iPads — more specifically, to handle the Home Indicator and the new aspect-ratio of the 11″ iPad. Regarding the new aspect-ratio, I realized that the best way to handle it was to completely refactor the UI to handle any aspect-ratio. This was tedious, but eventually led to the idea of supporting iPhone and AUv3, which, after the UI refactor, was surprisingly trivial! The refactor also led to allowing scales of various sizes (making chromatic possible, finally!). Lastly, supporting iPhone meant supporting smaller screens, which inspired most of the usability improvements. Regarding the Home Indicator, the best way I found to handle that was to just make it go away completely! And the only way to do that is with Guided Access. Not only does Guided Access remove the Home Indicator, but as you may know (I had no idea! ), it also disables all other OS edge gestures, essentially isolating your app from the OS. So no more accidentally swiping the control center or notifications! For me, for the way I use iOS to make music (one app per iPad), this is the absolute ideal configuration. Chameleon is an AUv3 compatible sampler instrument plugin for your favourite DAW. The program can run as a standalone app in order to record audio samples from the internal microphone or professional audio interface. It also supports incoming Inter-App Audio connections for sampling directly from other iOS applications, however it is primarily intended to be used as an AUv3 Instrument plugin for applications such as Cubasis, AUM, Auria, Meteor, Gargeband etc. The plugin can additionally be loaded as an AUv3 effect in order to record audio passing through it from other AUv3 Instrument sources, which makes it a very versatile and useful tool. So what is a sampler? A sampler is a device that allows you to imitate other instruments with just a few short audio snippits. Although it comes with a library of presets it also allows you to create your own. You do this by recording multiple audio clips and mapping them to the notes on a MIDI keyboard and Chameleon does the rest using a sophisticated pitch shifting algorithm to fill in the blanks. Recorded samples can either be layered or mapped freely over a 7 octave range and saved as individual presets. Presets are then organised into custom categorised banks which can be exported and shared with others. Just think, you can sample all your favourite synth sounds and carry them around on your iPhone/iPad without the inconvenience of lugging heavy gear around with you. Sample anything from musical instruments to vocal snippits, drum machines or ambient noises. The possibilities are endless. Recording is incredible easy. Just create a New Patch and press record. Chameleon will wait for you to play a note before recording begins. Once recorded press the LEARN button and tap the note range on the virtual or MIDI keyboard to map the sample. Repeat this as many times as required, tweak the settings and save your patch. 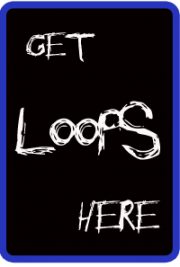 Additionally you can setup loop points with the ability to apply crossfade. Chameleon also has a quite sophisticated arpegiator which allows you to create complex mixtures of notes and chords with glide, hold and re-triggering options. On board reverb, digital delay and chorus effects are available to give your samples a more polished touch. We also include 4 touch pads for quickly dialing in on a sound or for easy effect automation. Configurable touch ADSR and modulation options are available too. Chameleon can also import audio samples using iOS Files integration or you can make use of Copy / Paste to quickly drop one of more samples into a patch. You can also freely edit samples using the built in tools such as normalise, fade in, fade out, crop, clear options etc. You can run Cameleon as a standalone app and map external MIDI keyboards (Bluetooth MIDI support also included) and perform audio sampling outside of your DAW. This is provided for convenience since you can’t record input when hosted as an AUv3 Instrument plugin. As mentioned earlier you can also load the app as an AUv3 Effect plugin too which allows you to record directly from other AUv3 instruments. Yes some DAW’s have built in samplers which only have the ability to playback libraries provided with the software. 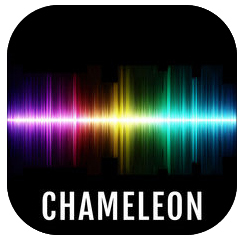 Chameleon allows you to built your own libraries of sounds and share them with others. There’s a budding rapper in you dying to get out and we have just the tool! 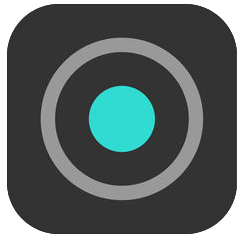 Runs as a standalone app for sampling purposes. Supports incoming IAA connections to compatible apps..
ADSR touch envelopes and modulation. ARP – Sophisticated programmable arpegiator. Reverb, Chorus and Digital Delay Effects with BPM sync. Backup and Restore patches and banks. Create your own user banks. 4 Touch Pads for automation. iOS Files App support for import and export. MIDI, Bluetooth MIDI and virtual keyboard support as a standalone app. Loop Points and optional Crossfade supported. Enso is an AudioUnit V3 plugin; it requires an AUv3 host like Cubasis, Garageband, AUM, etc. An architecturally unique and sonically characterful looping toolkit for producers and live performers, inspired by both modern looper pedals and vintage tape-based setups, Enso combines elegant and intuitive UI design with a deep but accessible feature set and stellar sound quality. Enso’s operation will be immediately familiar to users of hardware looper pedals or plugins such as Ableton Live’s bundled Looper. Start playback of the host DAW, hit Enso’s record button and capture your instrumental performance into a loop of whatever length you like, up to ten minutes (five minutes on iOS). Then, without stopping playback, overdub further passes to create layered grooves, complex harmonic textures, or dense, evolving soundscapes. Beyond those basics, though, Enso takes software looping into new territory. Two Overdub modes configure the plugin for conventional looper pedal behaviour or Frippertronics-style ‘dual tape deck’ manoeuvres, affecting the handling of the Feedback parameter for an endless range of layering possibilities; and up to four Sectors can be effortlessly defined, each with its own start and end points, for on-the-fly rearrangement of the loop. Onboard tape-style saturation, filtering and chorus effects bring dirt, frequency-shaping and stereo thickening to the party; and a comprehensive MIDI assignment system makes it a snap to set your MIDI pedal or button controller up for operation of all Enso’s buttons and switches. With its animated play and record heads, meanwhile, the looping waveform display provides a clean, clear visual representation of the potentially mind-bending temporal acrobatics taking place, letting you get a handle on exactly what’s happening at a glance. Sampletoy is a radical new musical instrument/plaything; part sampler, part granular synthesiser. Use it to capture sounds through the microphone, then play, loop, pitch and distort them live on the screen. There are plenty of features under the hood, such as resonant filters, delays and envelope. You can enable “stepped” mode to play your sounds like a traditional keyboard, or keep it in “free” mode for some microtonal madness. Once you’ve recorded a sound, use the main area of the screen to play it back at different pitches (up to 5 fingers at a time). You can crop the sound by dragging a selection over the waveform. The crop area is also multitouch and you can adjust the crop while playing the sound too. The y-axis is pitch of the sound, and the x-axis is configurable to control filters or envelope. * Create your own instruments out of any sound. * Email your performances as audio files straight from the app. * Built-in resonant filters, delay and envelope. * Auto-saves current recording and state and recalls it again on next launch. * Stepped mode allows chromatic, major, minor, pentatonic and whole-tone scales to be played. * Totally multitouch – play up to 5 notes at once. * 44kHz/16bit – professional quality sound. 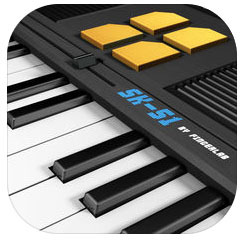 SK-51 is an all-in-one keyboard inspired by the Casio SK-1 (and his brother the SK-5), a 8-bit lo-fi keyboard from the 80’s, with sampling features and onboard drum machine. Called the poor man’s sampler at the time, this keyboard was a real instrument and has been used by many major artists such as Fatboy Slim, Portishead, Autechre and Nine Inch Nails. As some of us at Fingerlab compose their first songs with it when they were kids in the eighties, we wanted to bring back to you this particular feeling from the past, so we created the SK-51. We recorded all the instruments and drums notes, one by one with a professional audio quality (16bit/44KHz), we recreated the sampling features, and we transcribed all the demo drums patterns. We also added the sounds from the Casio VL-Tone, a keyboard older than the SK-1 but nevertheless famous. With its nice and true to life interface, many instruments (Trumpet, Flute, Piano, Vibraphone, …), 4 sampling slot and many drums patterns and sounds, the SK-51 is versatile and fun music tools. Record your voice, start the drum box, play a chord and you got it!